Welcome back! I’ve taken a little hiatus from writing to focus on my final few competitions before World Championships — it’s been a busy and exhausting few weeks…here’s a quick recap of it all! At the end of my last post, I was about to compete in the Lake Placid World Cup. Unfortunately, qualifications day didn’t go my way despite a ripping course and gorgeous sunny weather. Shortly after pushing out of the gate, I lost my balance, caught an edge, and suddenly found myself skiing in the left line, doing a spread off of the first air. Dumbfounded, I finished the remainder of my run as fast as possible. That afternoon — along with the next few days — were emotional for me. I wasn’t sure what was going wrong when I competed; it was quite difficult to come to terms with my performances thus far this season. I felt as though I had done everything I possibly could over the past few months to set myself up to compete well all season long. Not only had I done all the hard work, but I was consistently skiing the very best I ever have in training. When it came time to compete my run, though, I just wasn’t letting myself ski to the top of my potential. 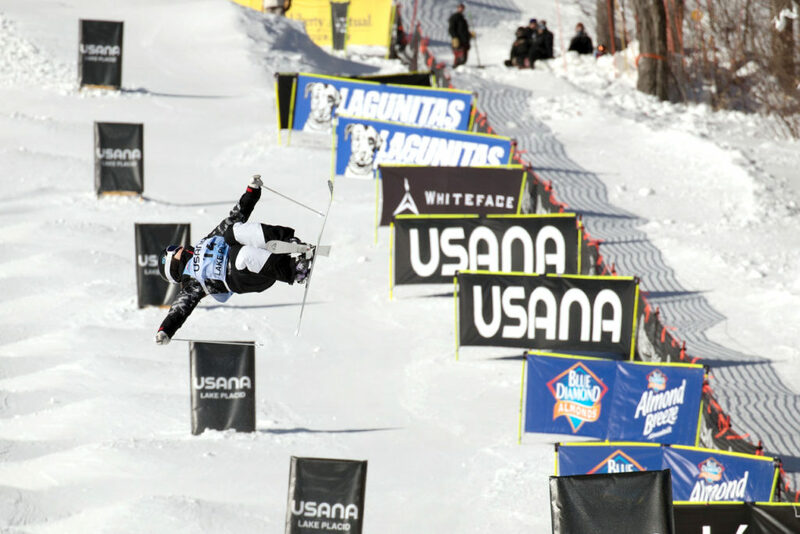 During my qualifications run in Lake Placid (photo: Reese Brown). I utilized my resources to talk it all out — my parents, sports psych, and coaches welcomed the burden of my frustrations over the course of the next few days. By finding comfort in those in my life who believe in me, I was able to find my own belief in myself, despite small, nagging doubts that had begun to infiltrate my mindset. A wave of determination, firstly motivated by my initial exasperation and later primarily founded in my sheer want, enveloped my persona. When I returned to training for a few days after Lake Placid, I had tons of fun that was grounded simply within executing my run. I made my performances simple and aimed to exude confidence. Mistakes in six competitions in a row were more than enough for me — letting my future be a duplicate of my most recent past was no longer an option. I carried this mentality with me through to Mont Tremblant, the final World Cup stop before 2019 World Championships in Deer Valley (!!!). Again, I kept things simple, found myself finding solace in those close to me, and kept moving forward with resolve. Singles day in Tremblant was the most fun I’ve had competing thus far this season!! Though my final result (9th) wasn’t exactly I was looking for, I proved to myself that I can lay down run after run in competition simply by channeling my feeling of inherent determination and belief. I woke up on purpose, executed my plan the way I wanted without hesitation, and let go of everything else out of my control. I ended up qualifying in 4th and finishing my day within a point of the top 6 girls! You can see both my qualifications run and my finals run below! My parents and I at the bottom of the course in Tremblant. Frankie and I at breakfast just outside of Mont Tremblant. Caroline and I at the bottom of the course in Tremblant with the sweet sign she made for me! Later that evening, in the very same room where Olympic starts were handed out almost one year ago to the day, I was granted a spot for World Championships!! I am incredibly thankful to have the opportunity to represent the United States in my second World Champs (at Deer Valley, no less — the best event of the year!!) and that my coaches believe in my capability to win medals at the biggest event of the year. The next week and a half will be devoted to final preparations for World Championships on February 8th & 9th under the lights on Champion!!! I’ll keep you all updated on my Facebook athlete page with more information on times and online/TV streaming as we get closer to competition!